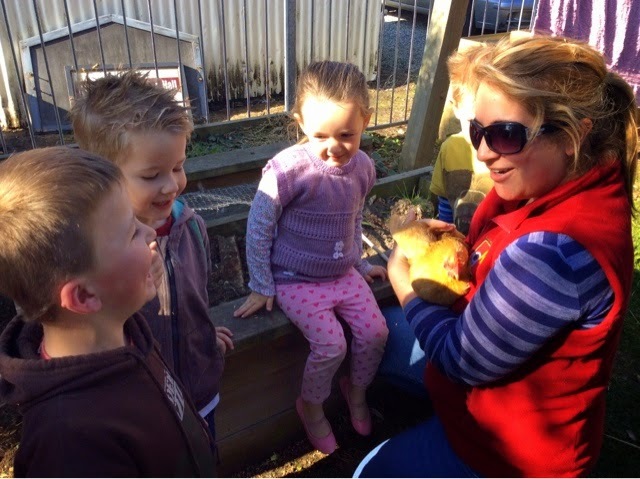 We are so lucky to have the company of our bantam hen 'Brownie' and our silkie called 'Silkie' each day at Kindergarten. This afternoon a small group of children saw them and ran over to investigate, naturally the hens turned and ran straight back through the gate into the area where they live. The children were interested to follow as they watched and pointed through the fence. Tom asked if we could go to see them. Ke tahi te whakaaro pai - Thats a good idea. Ashleigh was able to catch Brownie and we sat around together patting and describing the way her feathers felt. "Brown feather" Kathy said as she stroked Brownie. Caleb, Bailee and Jacob took much pride in gathering wheat in their hands and holding it out for Brownie to peck off. Laughter was heard as each piece of wheat was taken with a peck from their hands, a funny feeling was felt with the quick tap of Brownie's beak on each hand. 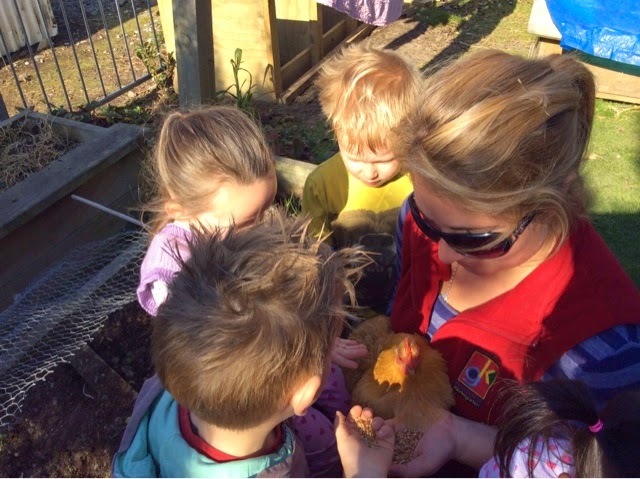 This experience is an example of this group of children showing manaakitanga/care and respect toward our hens while finding humour together as the wheat was pecked from their hands. This morning Tayla was having her morning tea outside, looking out toward the playground when she noticed something odd sitting on the grass. So naturally she went to investigate, to see what was inside the red bag. With excitment Tayla dropped her lunchbox and pulled out of the red bag 3 fire helmets - real fire helmets! By this time other children had gathered around "They're form my Dad" said James proudly. This morning we have all had so much fun using these new props to enhance our play, especially an ongoing intereset in emergency play. 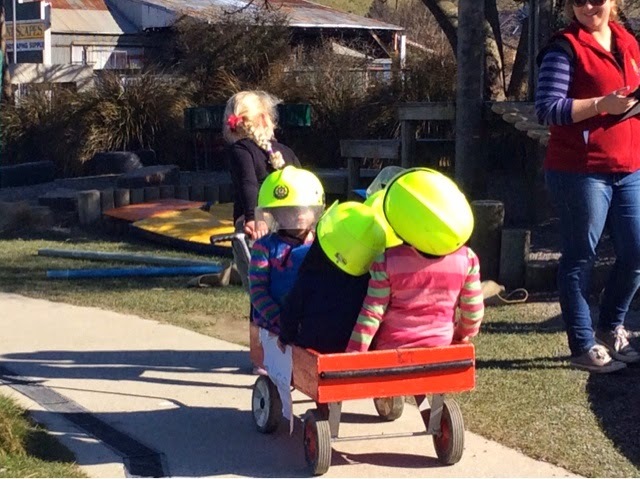 We would like to thank James' Dad Andrew for sourcing these helmets for us at Geraldine Kindergarten. Kia Ora Andrew. Today we were were lucky to be visited by Melanie a magician! Before Melanie arrived this morning we had a discussion as a group, sharing our ideas about magicians. "They have white bits at the top and bottom of the wand" Isaac P shared with great detail. Melanie arrive with lots of bags and suitcases, she set these up on our mat and childen gathered around to watch as she unpacked her magical equipment. Melanie had a special friend packed in one of her cases, it was Harry Pott the rabbit. 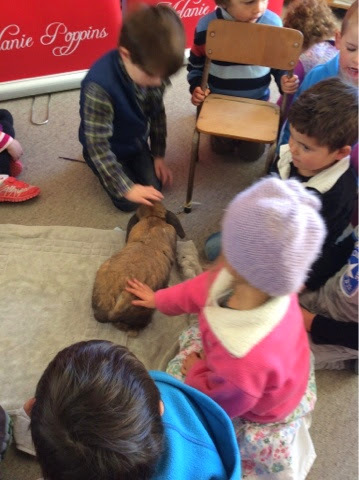 So children showed manaakitanga/care and respect as they gathered around and patted his Body. The show started with a bang as the children said abracadabra together to turn a dove into a bunny, Harry Potter had a friend to keep him company for the show. 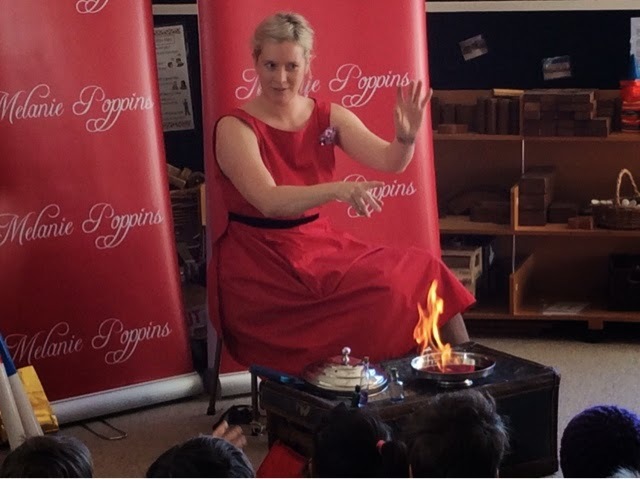 Ribbons were pulled from any place imaginable, long pipes were taken out of her very own 'Mary Poppins' bag, some of Melanie's friends played tricks on her and the children worked together/mahi tahi to make fire and turned it into lollies! The magic show was just magnificent, completely engaging every childs attention. Everyone watched with excitement as Melanie performed each magic trick, not able to anticipate what was going to happen. 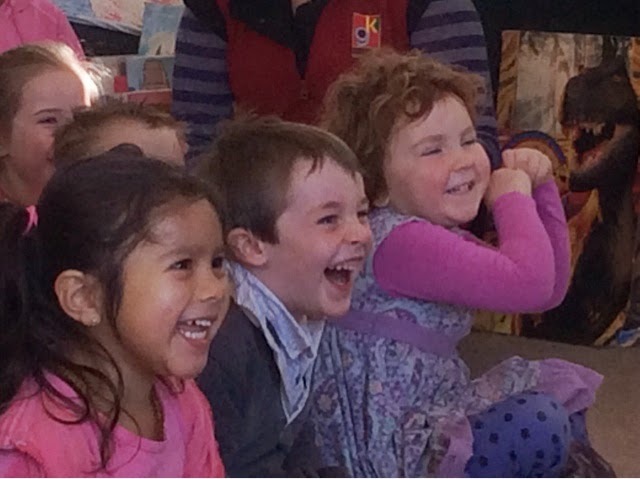 Gasps of excitment and laughter were heard throughout the Kindergarten, a sign of the humour and wonderment and awe that was found in each of the acts. We cannot wait to see Melanie again! Exploring another new sport, rippa rugby. 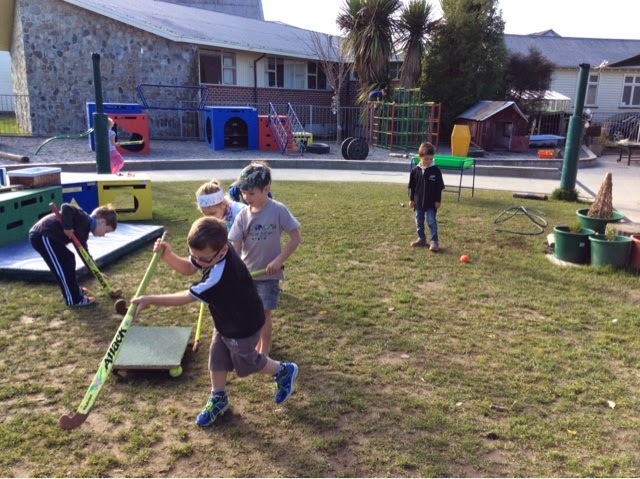 This term the morning children have been enjoying sharing their skills and knowledge of activites that they do at home with their family and whānau. 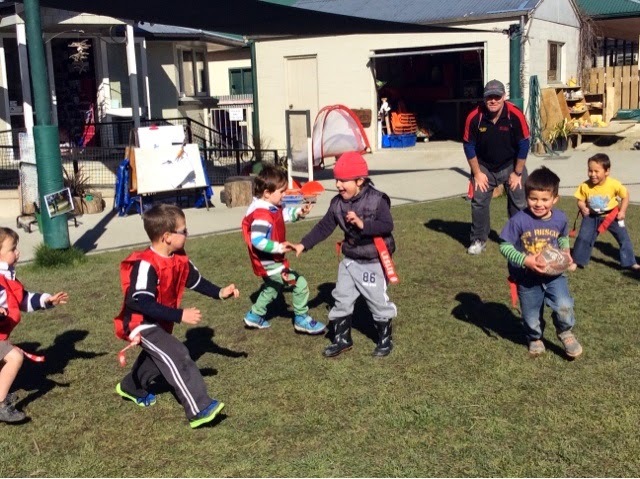 Today we were lucky enough to have Isaac's Dad Dale in to teach us how to play rippa rugby! 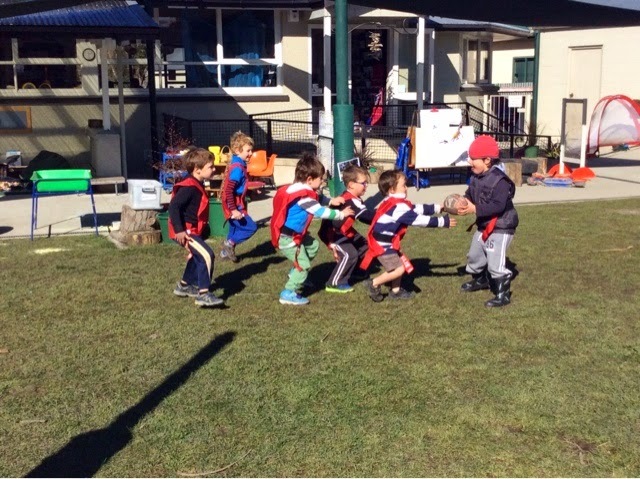 The children spent a period of time getting ready, putting on rippa belts and tags and then Dale explained some simple rules to how the game works. As the children played they wroked interdependently in their teams to pass the ball and help each other get a try. The children showed huge excitment when they got to their end of the feild to get a try. 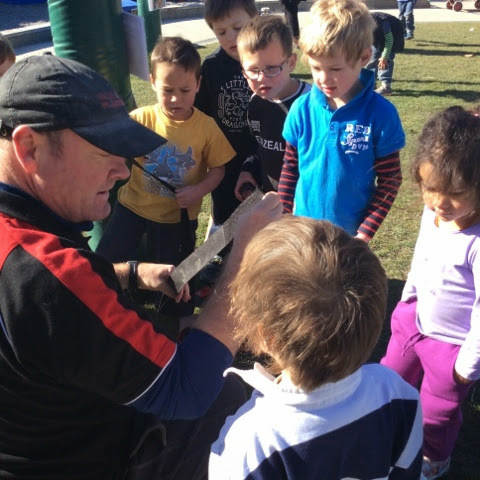 The children loved having Dale here to explore the rippa rugby rules, for some of our children rugby was something they have experienced before but for others it was a new experience, and they showed fantastic courage giving it a go and taking a risk. We had some fantastic skills showing through as the children explored this new game, maybe we have some future All Blacks on our hands. On Tuesday our afternoon children had fun exploring some different activities Liz had set up for them. 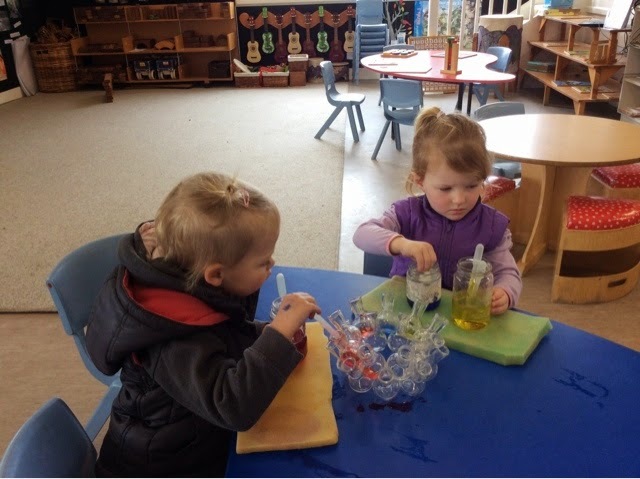 They explored mixing colours, using eye droppers to sqeeze the water up and then drop it into lots of small little compartments in a special vase Liz had brought from home. The children were predicting what was going to happen as they dropped different coloured water into the other colours. They spent long periods of time using their fine motor skills to squeeze the eye dropper to collect then release the water. 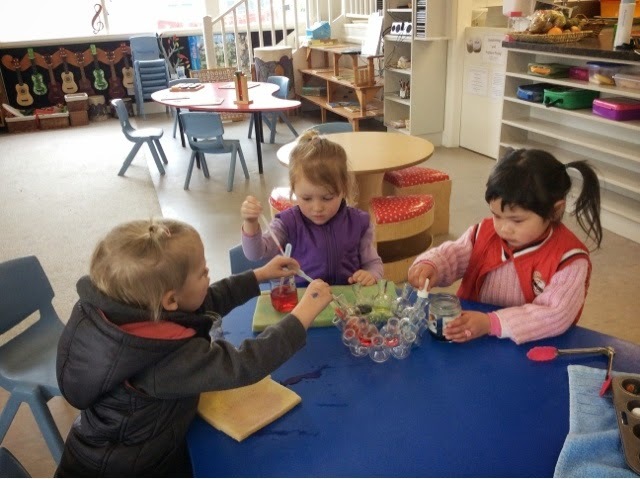 Concentration was key to getting the water into the small vases as they worked alongside each other. Fine motor skills were also needed to explore the marble activity Liz had set out as they children used the tongs to pick up the marbles and place them into different compartments and into the tubes. Children showed real joy as they watched the marbles roll in different directions after piling the marbles up in the tube and then lifted the tube to release them. This is great, he rawe tēnā! Last week when some of the children were busy making mince Abigail come up to me and asked if we could make cheese rolls. So today because it was a freezing cold day we decided what beter thing to do than to share a fresh batch of home made cheese rolls. That’s a good idea ,ke tahi te whakaaro pai. 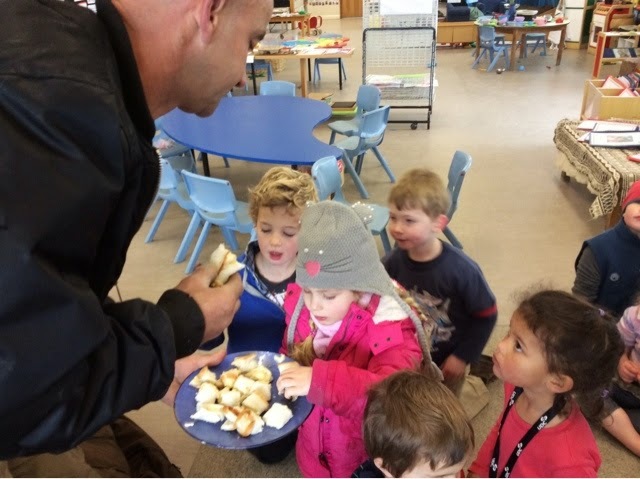 The children worked interependently to make the cheese roll mix and then to spread the mix onto the bread and roll them up. When the ceese rolls were ready we called all the children to the mat to spend time together sharing the product we had worked together to make. 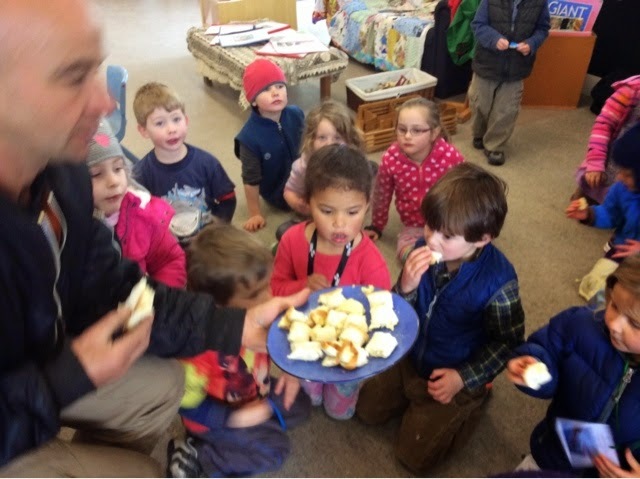 When we had finished eating the yummy cheese rolls the children had some fun singing 'Five cheese rolls in the bakers shop' some children got to pretend to be cheese rolls while others payed Louise some money to take a 'cheese roll' away. 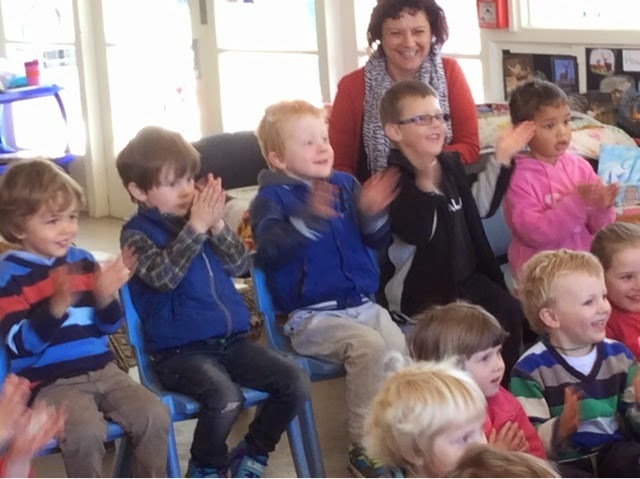 The children all managed their impulsivity as they waited to be chosen to take part in the fun song Louise was singing and acting out with the children. 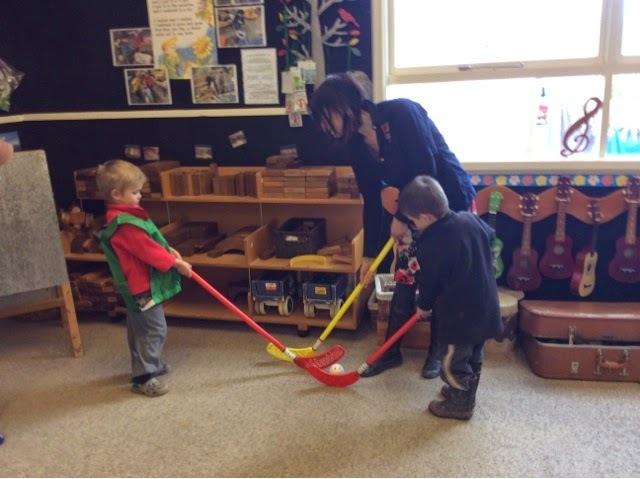 Hockey continues to be popular at kindergarten and there was plenty of interest when we brought out the ice hockey set for the first time in the afternoon. It was well utilised by the tamariki inside. Eye hand co-ordination was tested as the tamariki had a go at trying to hit the balls. Sometimes they rolled under shelves and lots of problem solving was used to figure out how to reach them. Turns out the curved blade is perfect for fishing the ball out! This links in with our current group planning to encourage more problem solving with this age group. For some children this was a new experience but they bravely gave it a go. This shows our afternoon children can take risks with their learning. 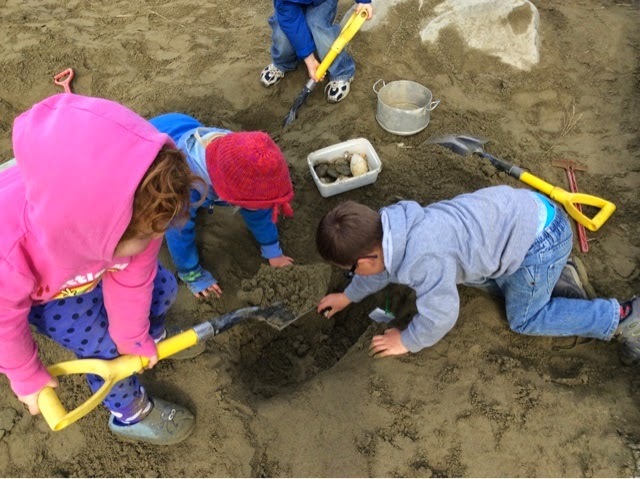 By being brave, they can be actively involved, discover and explore something new. They learn it's ok to make mistakes when learning but through humour, fun and persisting, they can achieve great results. These are important habits to learn. Tino pai! 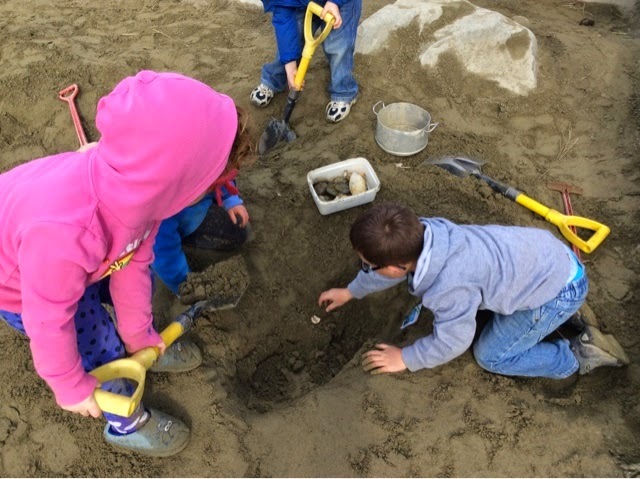 An enthusiastic group of explorers made an exciting discovery in the sandpit as they dug for " treasure" this morning . They found ... "real treasure!" one child excitedly shared . 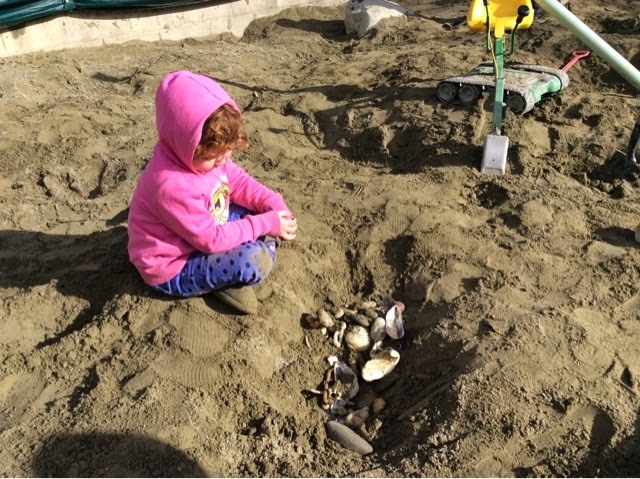 Wonderment and awe was clearly visible on the faces of the discoverers when they dug up a basket of stones and shells that had been missing, clearly buried on a different day . 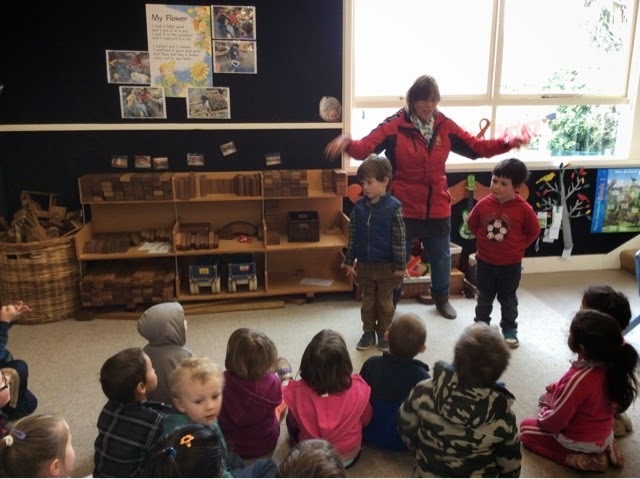 Working together , mahi tahi and sharing the excitement of a real discovery, kept this group engaged for a long period of time. 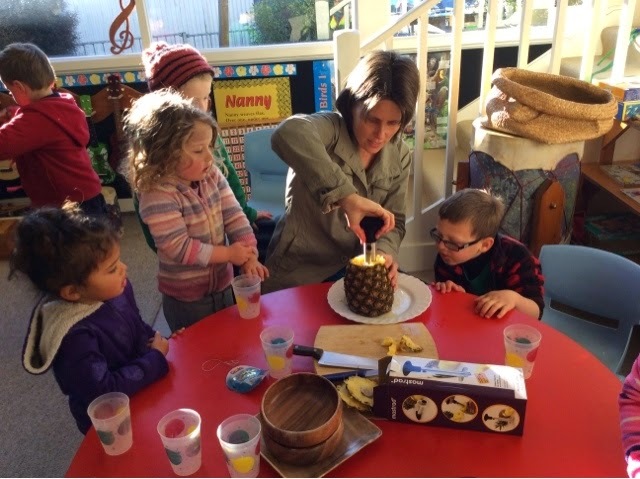 Grace's Mum, Andrea offered to bring in her pineapple cutter and work with the children to prepare the fruit for kotahitanga. After cutting the top of the pineapple off Andrea grinned because she noticed the fruit was quite soft and she was wondereing how well the expereince was going to go. The cutter sunk into the middle core and lots of juice began to overflow much to the chidlren's delight. The juice was eagerly drunk as the pulp was spooned from the rusk of the pineapple. Andrea smiled again as she said, "Nathan (her husband) says I always choose the wrong one!" 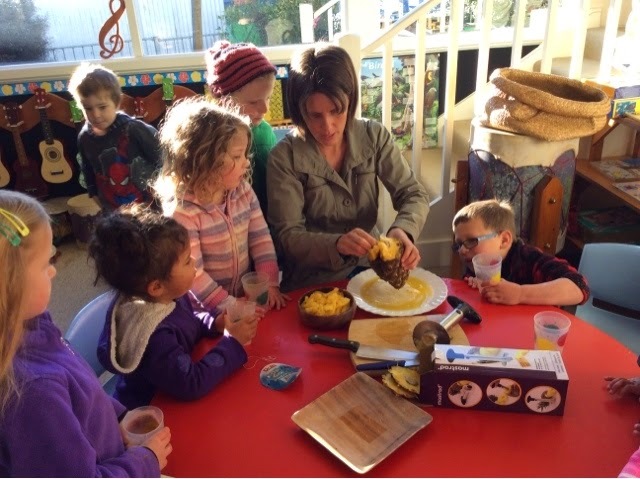 Too soft, too hard, the children experience the wonderment and awe the technology brings in food preparation. Kia ora, Andrea! 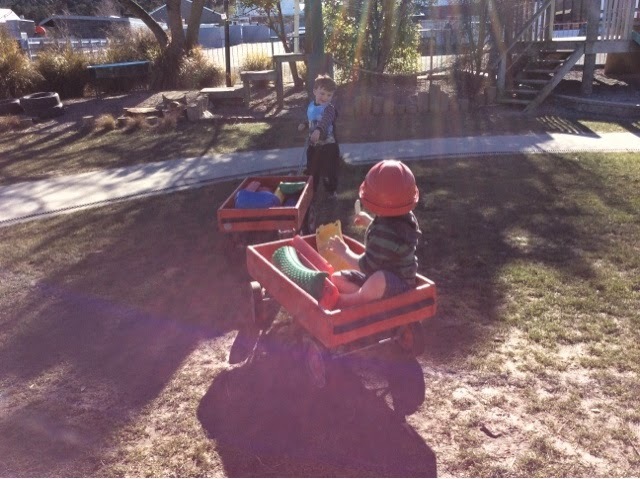 Jacob and Nathaniel just adore pullling the trolley around the playground. 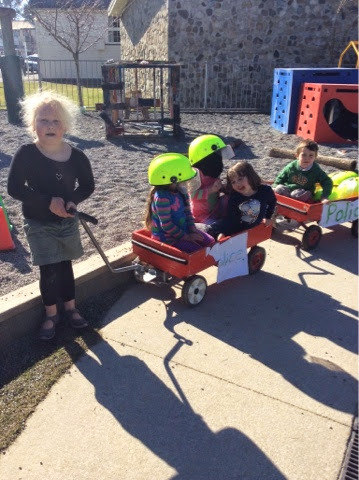 And their play has now moved to pulling all the trolley's around the playground! 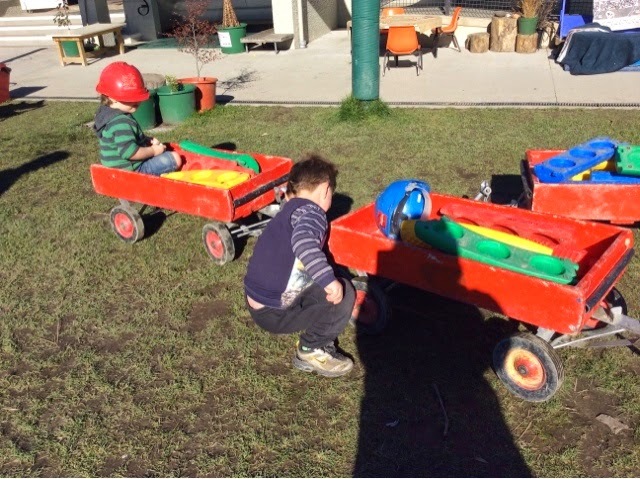 They have worked out that the handles can hook onto the axle underneath but the boys were puzzled because placing the handle under the other, the back trolley didn't move. Jacob was happy to watch Nathaniel try again and then Val offered her help and quietly showed that the handle need to be pushed under and then pushed to the side. The smiles grew and off the trolley's went together. Tino pai Val! But another problem had to be solved because when they went around the corner the trolleys came apart again! Not giving up! Perseverance to the forefront! They hooked it up again and away they went! Kia kaha nga tama! Success breeds delight and playfulness! Sandra arrived with a large bag over her shoulder filled with ice hockey gear. In comparison Ashleigh arrived with her very much smaller field hockey bag to show the children the differences in the sporting codes. 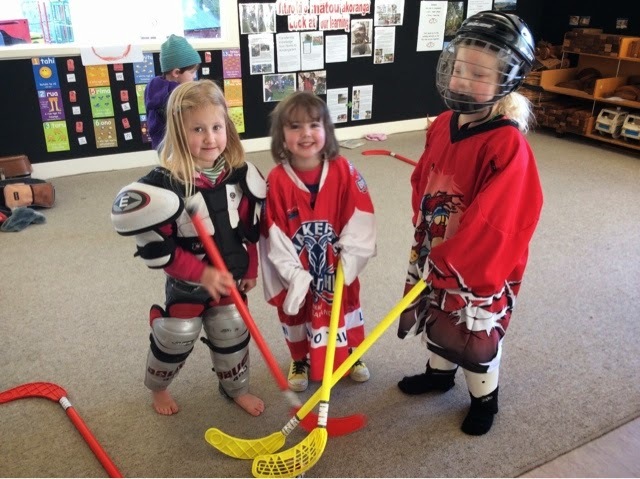 Ruby, Addy and Chloe were nominated as the next junior ice hockey team for Sandra to coach! 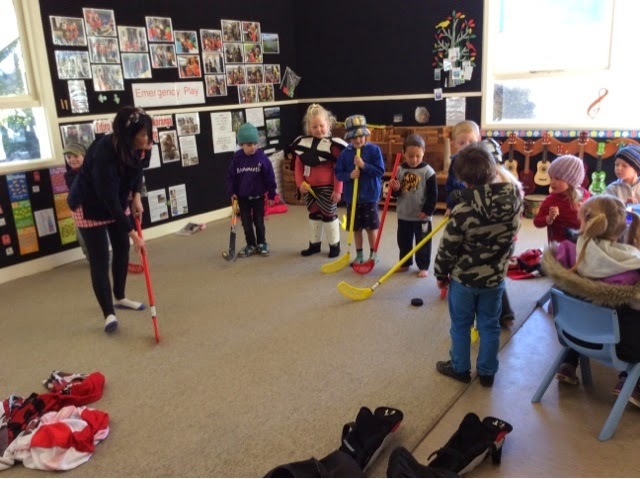 The children also got a chance to participate in a simple hockey drill as they expertly pushed the puck back to Sandra. And they were very clear stating the rule of 'sticks on ice'. 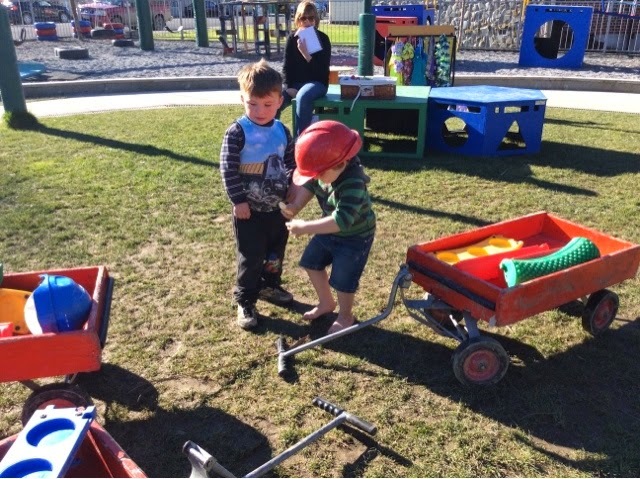 Manaakitanga/ care and respect is valued at Kindergarten. 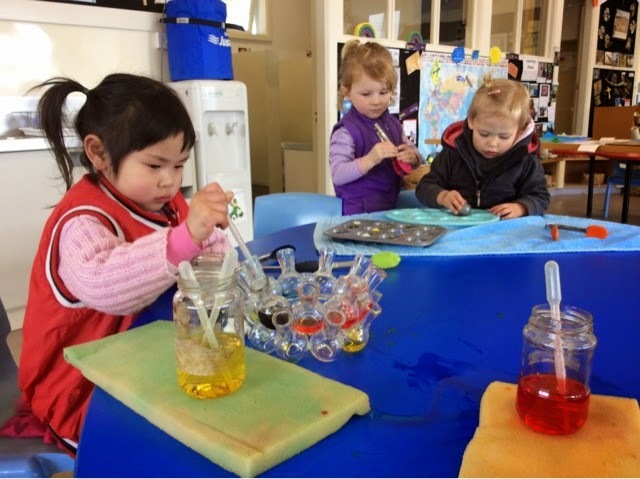 Our tamariki are amazing as they give things a go and as kaiako/teachers share what they do beyond the Kindergarten, children get to know that they do things away from their work place! 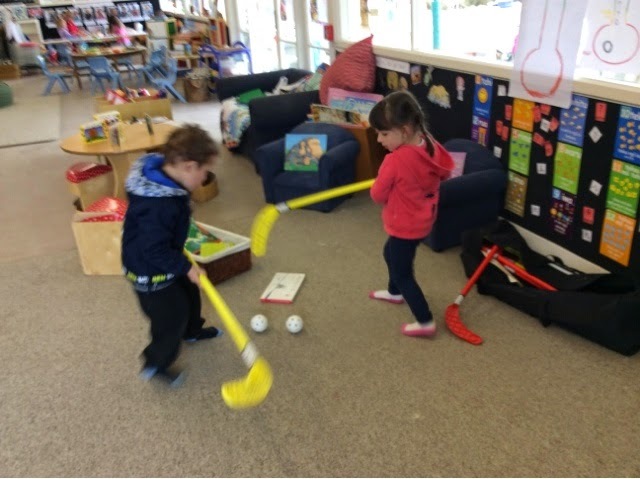 Recently we have borrowed some resources from WAVE that is run by the South Canterbury District Health Board, children have enjoyed using these resources and today were introduced to a bag of hockey sticks and balls. 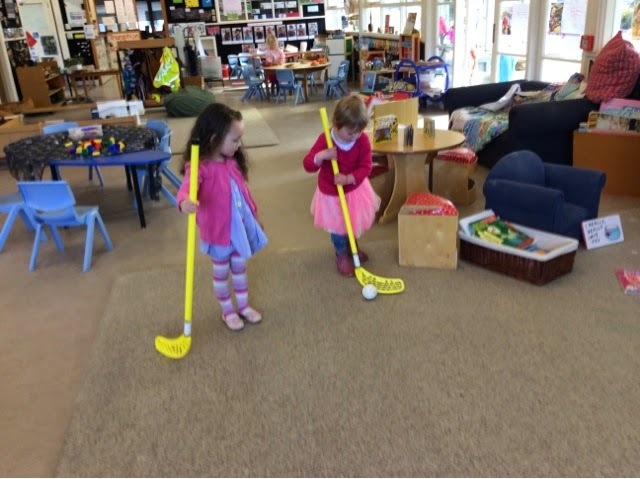 Some children got a stick from the bag and began to use them to move the ball around. 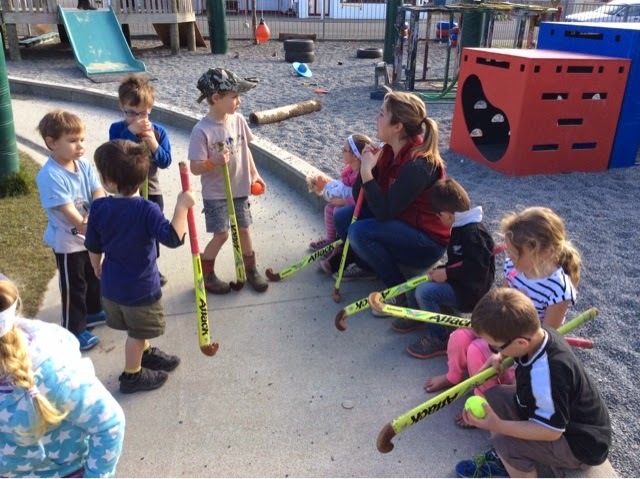 Some children pushed the ball around on their stick while others hit it as hard as they could. 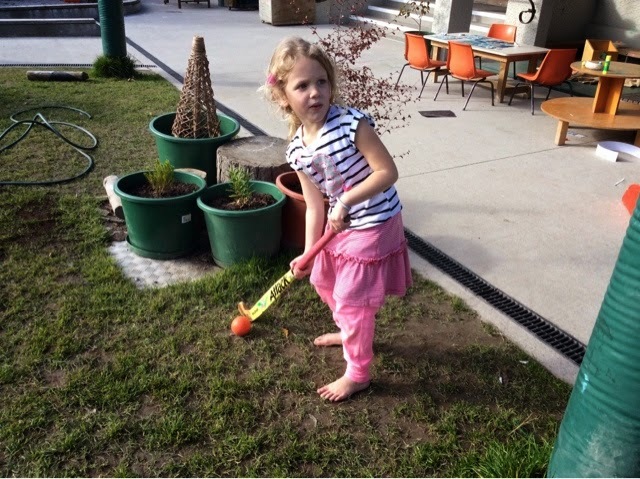 Ashleigh (our very own hockey player) supported the children to hold their stick in the 'right' way to support their strength when holding the stick. After spending some time exploring the possibilities with the sticks Ashleigh decided that it was time for a team talk after noticing lots of children swinging their sticks above their heads. 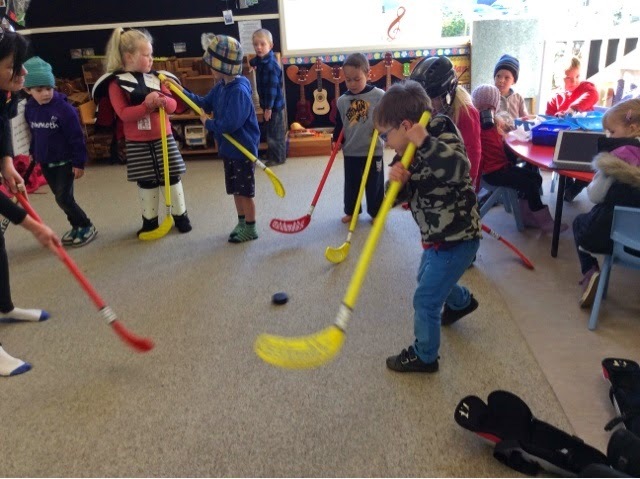 So we all gathered together and talked about using the hockey sticks in a safe way, all suggesting ways that we can keep ourselves and others safe - we linked this to one of our key values here at Kindergarten manaakitanga/care and respect. - children decided that we needed numbers to make teams. Jed said we need paper and pens to do this. He pai koe ki te whakaaro pēnā - Thats good thinking! So next week the teaching team are going to use have these pn offer to play with while using the children's ideas outlined above. We will remind them of these and help build upon their ideas and understandings of what it means to be a team/in a team and even be the captain of a team. Keep an eye out next week to see where the children take this interest.